If you can’t spot your favorite breakfast-bearing food-mobile this week, fret not. 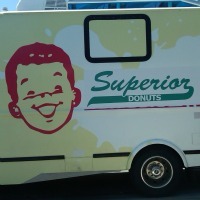 From today through Friday, June 3, L.A.’s Buttermilk Truck will temporarily be dubbed the “Superior Donuts Truck” in honor of the play by the same name (yes, there’s a play called Superior Donuts), which opens for previews tonight at Westwood’s Geffen Playhouse. Oh, and if you didn’t already have it marked on your calendar, Friday, June 3 is—wait for it—National Donut Day! To celebrate the deep-fried, maple-glazed holiday, the cast of the play will be serving the truck’s signature cake donut—er, we mean the “Superior Donut” —from 11:30 a.m. to 2 p.m. on Friday outside of the theatre. Rumor has it that Gary Cole from Office Space and Edi Gathegi from Twilight will be among the donut-hander-outers. We’ll take a baker’s dozen.